Andrew Sturgess has many ambitions in life; to be a positive role model as well as play the game he loves; football. Andrew definitely leads a busy life, currently in his last year studying a Bachelor of Education at Victoria University, working part-time at Parksville Youths Justice Centre as well as dominating at Coburg Lions. Andrew teaches younger kids that have suffered dramatically and aims to improve their lifestyle by educating as well as just simply being their friend “To see them better their lives, or simply play kick to kick is extremely rewarding for me, I love it”. Andrew prides himself in being a positive role model for the younger boys at the center as well as being a leader around the club. Whilst talking with Andrew I could immediately sense that hard work and commitment were a reflection of his personality, not just with work but more importantly football. Being a first year player, Andrew has really shined both on and off the field; part of the leadership group, Andrew loves mentoring the younger group of boys and is extremely appreciative of the chance to be a ‘big brother’ to his group “To be put into the leadership group in my first year, it’s really a big honor”. Andrew really puts forward his drive and commitment in ensuring his best work is put into helping younger kids, being a role model for his younger brother as well as being an all-round leader for his group. Funnily enough, both youth work and football are somewhat similar, in both cases Andrew is the epitome of a leader. As a footballer Andrew abides by “Making every minute count”. Andrew plays in the mid-field, as a first year player, Andrew is definitely making a name for himself. 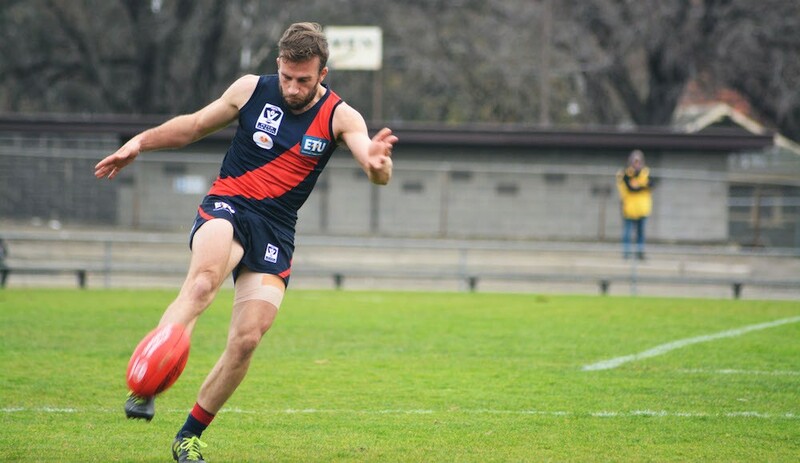 As a player you’re wary of constantly strengthening your skills to make you an even better player; Andrew has the ability to run, ability to win contested footy and is adamant that better things are yet to come. Playing football has always apart of Andrew, with his grandfather playing for Richmond in 1958 and his dad being a constant support system, playing football was a no-brainer. Being apart of a large family, Andrew’s support system is quite large. A couple years ago, a close cousin of Andrews suffered a terrible work-accident but thankfully through hard work survived. After the accident Andrew made the promise not only to himself but more importantly to his cousin to do his absolute best, work his hardest, put his football into gear to one day make the dream of AFL a reality. ‘It’s never too late, to always follow your dream; if they’re willing to put the time in, they can do it”. Andrew was recruited from Eltham, winning the 3rd Best and Fairest award; ultimately kick-starting his career as a footballer. Transitioning from a local football club to play VFL level has been different but nonetheless playing at Coburg Lions has been “fantastic”. Playing along the winning side a couple weeks back was a great feeling and only a small proportion of what Coburg is all about. The focus for the whole team is team-involvement and following the instructions given out by Germo, the culture and brand they’re building will only continue to grow and soon enough Coburg Lions will definitely be a powerhouse club. Playing alongside the boys has been a great journey “We care for one another, we enjoy playing as a team which helps out on the field, I love it here”. Football manager, Nick Johnstone, only has great things to say about Andrew, “Being a local footballer, who works extremely hard as well as being selected in the leadership group in his first year is great. I just think he’s a great kid”. Andrew described himself as ‘compassionate’, a trait that was evident throughout the entire interview. Andrew’s kept his promise to do his absolute best with football, you can bet, better things are yet to come.